Rodrigo Medellín is passionate about bats. He would like you to be, too. At the base of a craggy hill in the middle of Central Park, under one of those rocky overpasses you're not supposed to pass over after dark, a waterfall settles into a shallow stream. The stream smells. Like pond scum, mostly, but also, a little bit, like urine. And damp stone. And the various salty-sweet scents of city that have been liberated from concrete via the steam of summer. It's late in the day, and the heat hangs, and a siren wails in the distance, and we are somewhere near, best I can tell, 99th Street. So it takes me by surprise when Rodrigo Medellín plops onto a rock, rolls up his pant legs, and plunges into the water. He's looking for bats. Actually, technically, we are all looking for bats. Medellín, a professor at the National Autonomous University of Mexico, is a bat biologist. A celebrated one, in fact. And he's leading a group of us -- researchers, park volunteers, students, curious hangers-on -- as part of the Central Park BioBlitz, a 24-hour-long effort to take a census of Central Park's wildlife. Some 500 sophomores from the Macaulay Honors College are participating in the census -- a project, co-sponsored by the Central Park Conservancy, that is not only meant to provide data about the Park's biodiversity (some 800 species, at last count), but also, as College dean Mary Pearl puts it, "to celebrate science as a way of knowing." There's been only one other biodiversity survey of this scale in Central Park, and that one took place via an initial BioBlitz exactly ten years ago. In 2003, Medellín tells me, he and his team found "three big browns in the Ramble" and "the carcass of a red in the Great Lawn." He says this excitedly. For a biologist -- one who happens to hunt bats for a living -- three big browns and the carcass of a red are good finds. They offer good data. For the bats of the 2013 BioBlitz, however, the story might be the lack of data Medellín has at his disposal. Part of the point of the BioBlitz is to see which new species might have come to the park (some of the groups are given Western-style "WANTED" signs for species that ecologists suspect might be new to the ecosystem), and which ones might have left or died away (wild rabbits, for example, haven't been spotted in the park since 2006). And this is where Medellín will play a crucial role in the survey. Bats have never been particularly plentiful in Central Park, but there is good reason to believe that they're significantly less plentiful in 2013 than they were ten years ago. And that's because the bat population on the East Coast has declined sharply since the last census. Sixty-five percent of the U.S. population of big brown bats -- the kind of bat you likely picture when you picture a bat -- has died in recent years. And the population of little brown bats has declined by a whopping 89 to 95 percent, meaning likely extinction for the species. There are the typical explanations for all this (human encroachment on habitats) and the less typical (human encroachment via wind turbines, which create pressure differentials that burst the blood vessels in bats' lungs). But the declines have reached extinctionary proportions for another reason, too: a fungus that attaches to bats' bodies, particularly their wings and snouts. The result of this is an illness known as white nose syndrome -- one that kills bats by compromising, scientists believe, their ability to hibernate. Sleep deprivation, essentially, brought to a fatal extreme. The syndrome has led to the death of nearly 6 million bats, across all species, since 2007. And for little browns, in particular, for reasons that are currently not well understood, the syndrome proves especially deadly: For colonies of little browns, the mortality rate can be 100 percent. Medellín, for all these reasons, is not expecting to encounter a little brown bat among our survey. Which isn't to say, however, that he's not really, really wanting to. "If we could find one," he says, "it would be a treasure." When you're an expert on something that's facing extinction, hope is an important part of your toolkit. Medellín's first word, he tells me, wasn't "mama" or "dada"; it was "flamingo." Some of his earliest memories involve studying the animals of Africa. He auditioned for a TV quiz show in Mexico -- and became the first kid to make it onto the program. He got to choose the topic he'd be quizzed on, and the topic he chose was "mammals." He made it through six rounds. Though he didn't win, in the end, professors at the University of Mexico -- leading experts on bat biology -- happened to see his performance. They invited him to work with them at their lab. He was 11 at the time. From there, it's been bats all the way down. Medellín has been the author or co-author of more than 50 scientific papers in international journals, as well as 15 books and book chapters on bat ecology and conservation. And his work is taking on a new significance today, as bats' story has shifted toward endangerment and extinction. In all that, Medellín finds himself navigating two different, but related roles: data-driven scientist and emotion-driven advocate. "You never know what's going to happen in the future," Medellín points out. 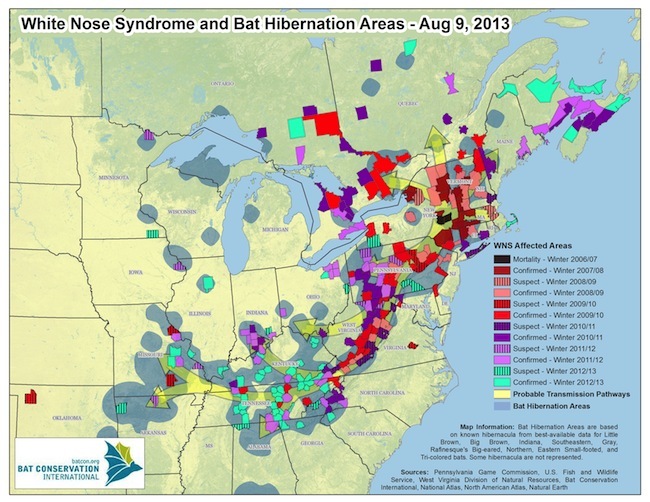 "If we'd had a stronger effort 10 years ago on bats, we would have shown the effects of the white nose syndrome." We would have had a greater chance of understanding the illness that is proving catastrophic for so many bat species -- species that, with a diet consisting mostly of insects, play a crucial role in maintaining the ecological balances we humans have come to rely on. And humans are critical components of Medellín's work. The biologist is well aware of the public perception of bats as creatures that, he says, are "dirty and vectors of some kind of disease." He wants to change that. He wants to make people care about bats' plight. And one way to do all that is to become an expert in another ecosystem: the one that thrives on human attention. Medellín is a senior professor at the University of Mexico. And also an adjunct professor at Columbia University. And also an associate researcher at the American Museum of Natural History. And at the Arizona-Sonora Desert Museum. He is a resident of the Mexican Society of Mammalogists and chair of the Latin American Fellowship Committee of the American Society of Mammalogists. He has represented Mexico before the the CITES Animals Committee. He is the subject of an upcoming BBC documentary. He is the first winner of a newly-created annual award from the UK's Whitley Fund for Nature, which honors "an outstanding individual contribution to conservation." He received the award, at a gala event, from Princess Anne. Medellín is also in his 50s, and aware that, just as in nature, the continuity of one's cares depends on the next generation. Which is largely why Medellín is at the BioBlitz in the first place -- and largely why he really, really wants to capture a bat. Not just as a biodiversity data point, but also because physical proximity has a way of encouraging interest and empathy. Here in Central Park, Medellín has a captive audience of college honors students who have a stated interest in science. They are, for him, a very special kind of public. And he wants to show them what they've been promised: a bat. Up-close, personal, and as wild as you can find in New York City. So, we hunt. Armed with nets, long bamboo poles, and shorter metal poles, our little group traipses through the close-shaven grasses of the Great Meadow, down the rocky path that abuts Olmstead's manmade waterfall, and toward the bat-friendly underpass. One of the Central Park Conservancy members has seen a roost there, Medellín says, and he's excited. A roost would be its own kind of treasure. "I'm thinking they're brown bats -- it's a common one," he tells me as we walk, referring to the big browns. "We'll try to get a count of how many: how many bats are living in that roost," he says. "And if so, that would be good information for the park. And to protect the bats, you know." We arrive at the site of the roost. We're nearing dusk. Medellín extracts a small flashlight from one of his equipment bags. He climbs onto a rock. He shines the light onto the concave wall on the other side of the stream, moving the light toward the corners and crevices. He moves quickly at first, then more slowly. He crouches. He adjusts his angles. He streams his light onto every inch of the wall. He does it all over again, just to be sure. He turns to us. "There's nothing here," he says. He sighs. And that's how Rodrigo Medellín, world-renowned bat ecologist, ends up shin-deep in a stream in the middle of Manhattan, dainty dimes of pond scum swirling around his legs. Since the bats haven't come to us, we're going to go to them: We're going to set up nets to ensnare them. Medellín is carrying a stake and one half of a large net -- one that, at about three feet high and many more feet wide, is black and filmy and slightly sticky to the touch. It's called a mist net, technically, and it's been designed for the specific purpose of capturing bats as they fly. Bats navigate using echolocation; a strategically placed net, a BioBlitz ecologist explains to me, can ensnare the bats' feet as they change direction in their attempt to avoid a collision. It's a tricky little system that uses bats' keen navigational intelligence against them -- but it's one, Medellín points out, that is required if humans want to capture (and thereby study, and thereby help) the animals. The mist net, he says, "is a standard method all around the world." So Medellín, still in the stream, delicately strings the rings of the net's outer edges onto the pole. He plunges the pole into the silt, balancing it against the shiny rocks that jut out of the water. He shakes the pole, frowning. "I don't like this," he says, as the net sways gently in response. "I want to make it tighter." He adjusts the net. Across the stream, on the paved part of the underpass, Medellín's assistant, Angelica Menchaca, is making similar adjustments. Menchaca is young -- in her 20s -- but she and Medellín have by now worked together for years. Before she was a grad student at Columbia, she was in his class at the University of Mexico. "This is my student," Medellín says by way of introduction, "slash assistant, slash --"
"Slash ex-student, slash student-forever, slash teacher-student." Together, they tighten the net on the poles to keep it taut. Medellín makes one final adjustment, then walks back across the stream. The parts of his feet that are not covered by sport sandals are now covered by mud. He is grinning. We leave one member of our group to monitor the net -- bats, being smart, will chew through the netting unless you extract them right away -- and make our way downstream. We have more nets to set up. And dusk is falling, rapidly. The stream that smells like pond scum now also smells like Off! Deep Woods. The cicadas are buzzing, and the leaves are rushing, and we are far enough into the park's wooded area that the sirens' wails have been silenced. We find another netting spot. Menchaca dons waders -- their waist almost reaches her shoulders -- and trudges through a stream that has gotten deeper as we've walked into the park's interior. From the other bank, she strings the net and plants the pole, securing it with a rope she ties to a tree. Medellín does the same thing on the other side. A young woman in a sundress and flip-flops meanders by on the footpath above the bank, looking at our motley assemblage of poles and nets and waders and hiking boots. She walks past us. She stops. She turns around. "What are you doing?" she asks the group. "An inventory of everything alive!" Medellín shouts. He doesn't look up from the net. A few more adjustments -- the net needs to be taut enough to block bats' flight paths, but loose enough for them to entangle in it -- and the trap is almost ready. "Arriba, sí, arriba!" Medellín yells across the stream. Menchaga moves the net upward. Then, in English: "You're set? You're tight?" he asks. Menchaga nods. It's getting darker, and he's getting more impatient: The darkness is good for bat-hunting, but less-good for net-setting. "Okay," Medellín says. "Now we need to go a little bit further away from the nets so that we give the bats a bit of space." We move along to the next site, remarking as we walk how dark the park can become, given its place in the middle of Manhattan. "Hey, it's a bat!" shouts Duane Harper Grant, a former gardener for Central Park and a volunteer guide for the BioBlitz. We look up. A bat flies over us, its wings flapping distinctively. Then another. "This is a really nice spot," Medellín says, nodding. We move on. We set another net. Another of Medellín's assistants for the BioBlitz, the Fordham masters student Kaitlyn Parsons, does the wading this time. She kicks up pieces of submerged park detritus -- branches, trash -- as she goes along. The trap established, we walk back to the second net. There's something stuck in the middle of it. It's only a bird -- a sparrow, from the looks of things. That happens every once in a while. Medellín frees it. After gamely posing for a picture. We set up another net further downstream, where a group of students -- Macaulay kids cataloging mammals of the non-flying variety -- joins us. Leaning into the stream bank, Medellín goes into professor mode. "Call me Rodrigo," he says, jovially. "If you have any questions, I'm here." The students crowd around him, standing on rocks and twisted tree trunks to get a better view. They do have questions. Do bats bite? (Yes, but most species don't -- most species eat insects.) Have you ever been bitten by a bat? (Yes.) Does it hurt? (Yes.) Where do bats live in the world? (Everywhere but the poles.) It's dark by now; the screens from the students' phones are, at this point, the only sources of light in the stretch of Central Park that is almost indistinguishable from wilderness of a less city-bound variety. "What we're trying to do here is, you put your brain into bat mode," Medellín explains as he balances two sandal-clad feet on the steep stream bank. "And just picture: Where would a bat fly through? A bat would not fly through this water here," he says, motioning toward a leaf-covered section of the stream, "because there's a lot of leaves and branches that they have to navigate through. Instead, if you go here and you see, right here" -- he points to the empty space between the water's surface and the leaves -- "you're going to see a tunnel. And with overhanging vegetation like that, that is forcing the bats to come down closer to the water. And that's what we want." A Central Park Conservancy volunteer checks in to make sure our group of ad hoc ecologists has not interrupted the park's more traditional nocturnal activities. We're fine, though, and Medellín doesn't want to lose a moment of time with the students. He wants to get them that bat. He looks back at the net, shaking it to test its tautness. He frowns. It might not be tight enough. "You're actually Batman!" a student shouts, giggling. Medellín chuckles. "Sometimes they do call me that," he replies, tightening the net. "Sometimes they do." If you are what you care about, then Medellín is, indeed, Batman. And he wants, as a scientist, lots of Robins. He has them, too. Long after darkness has fallen, we meet up with another bat-scouting group, this one using sonar detectors to catalog bats as they fly by. Among that group is Chanda Bennett, a post-doc at the ‎American Museum of Natural History who focuses on ecology and evolutionary biology. And whose particular interest is bats. "I'm biased, of course -- I'll put that out there -- but it's amazing work," Bennett says. "Bats are an amazing group of organisms." Bennett's love of bats began at Cornell, she tells me, where she worked as a technician with a colony of vampire bats (which are exactly what you think they are). "They were amazing, and seemingly intelligent -- I'm anthropomorphizing, but that's okay -- and just incredible to learn about at a stage where I knew nothing. I was a sponge. And it just escalated from there." Bennett, as part of her work, conducts acoustic surveys of various parks in New York. She and a colleague show me the devices they use to conduct those surveys: ultrasound sensors that look like light-gray Walkmen. The devices record the signals as both sounds -- I listen to one recording that seemed to consist of a series of high-pitched squeals -- and visual data. "They're location calls," Bennett explains of the variations. "You know, navigating: what to avoid, what to seek. One is looking for identifying the landscape, the other is identifying prey. And another is social calling -- talking to each other." And how do we humans know how to distinguish among the calls? "It's the pattern that we see when we're looking at the sonogram," Bennett says. "You can also hear it, to some degree. Sometimes when the calls start off in a discreet, steady pattern, that might be like a search phase. It's examining its environment, it's understanding what is where. Then when it gets into a feeding stage, the calls get much more choppy -- and frequent. You know. And then it's just, chopchopchopchopchopchopchop, and then it's quiet. And then it starts again." It begins to rain -- at first a light drizzle, then a less-light one. The sonar detectors are not waterproof. They are, however, expensive -- $1,000 a pop. We put them away. We return to the second net. It has has something snagged in it. It's smaller than the bird was. It seems to be darker. It seems to be a bat. "Are you excited, Rodrigo?" Menchaca asks. "No!" he replies, grinning, as he bounds down the bank toward the net. It is, indeed, a bat -- a big brown, as Medellín predicted. Which is a slightly ironic name: With its wings collapsed, the creature fits neatly into the palm of Medellín's hand. He holds it with his thumb pressed onto its back, in the soft spot where its wings would spread if they weren't encumbered by a human appendage. None of this hurts the bat, Medellín assures us. He picks up a white pouch with a drawstring opening. Into it, carefully, he places the bat. "This is just poplin, which is 100-percent cotton," he says, "and it's very non-abrasive for the wrists of the bats." He tends to talk about bats that way, in human terms. He discusses bats' shoulders and joints. Wings like fingers and arms. He ties a rope around his waist. He ties the strings of the pouch to the rope -- a bat belt for the Batman. We continue walking. We're walking quickly. We've caught one bat; there's a chance we'll catch more. We do, in the end, catch more -- a silver-haired that squeals and hisses under Medellín's thumb. And then another big brown. Medellín will add them to his bat belt. We'll follow a park guide to a clearing near 110th Street, where Pearl, the dean of Macaulay and a friend of Medellín's, has assembled a group of students. They're eager to see a bat. The students, clad, like Medellín, in BioBlitz t-shirts and tags, crowd around the professor as he stands, thumb on shoulder, demonstrating his catch. Phone-cameras flash. Medellín stretches out the animal's wing -- assuring the students, again, that this won't hurt the bat. He points out the fine bones, the fine veins, the fine hairs that help the bat navigate its way through the air. He is delicate. When he captures a bat like this, Medellín notes, his policy is to try to make it not only painless for the bat, but also worth the animal's while: He feeds the animal before setting it free. "To help it with its energy reserves," he says. This bat, made into a sudden celebrity, has earned its reward. Medellín perches on a block of cement, carefully cupping the pouches as he sits. The students reorient themselves around him. From one of his bags, he removes a plastic container that looks like it would contain yogurt save for the fact that "MEALWORMS" is written on its top. Medellín lifts the carton's lid. He cradles the bat, on its back, using the cotton pouch as a kind of makeshift bed. The animal's mouth is open, revealing tiny teeth. Using a pair of short tweezers, Medellín extracts an inch-long worm from the container. He coaxes the worm into the bat's mouth. Both animals squirm. But the students are transfixed.